Northern Thailand is elephant country. In the past, the animals were trained and worked in the lumber industry and on public works. Now, these elephants and their descendants are retired and are given a better life in the elephant sanctuaries of the Chiang Mai region. However, some tours still offer elephant riding. Some of these have been turned into real tourist factories; big operations that serve the many tourists that visit each day. PM Tours values the smaller sanctuaries that give the elephants all the room to move around and that only exposes them to small groups of visitors. PM Tours has a strict no-riding policy and only offers ethical elephant tours. Here is our Top 3 of the best elephant sanctuaries in Chiang Mai. What makes an elephant sanctuary? The bottom line is the respect with which the animals are treated. At a real elephant sanctuary, nobody rides the elephants and the elephants are not forcibly made to do anything. They have freedom to move around and have plenty of room to do so. The elephants are cared for and receive adequate medical treatment when they develop a health problem. Of course, there is no prodding, use of hooks or hitting the elephants. The Mahout is the traditional elephant trainer: mahout means elephant 'rider' or 'keeper'; but in sanctuaries the meaning of 'caretaker'; is more appropriate. Read more about the role of the elephant in traditional Thai culture HERE. This sanctuary has a special place in our hearts because it's the first small elephant sanctuary PM Tours worked with, now more than four years ago. Happy Elephant Home currently has five elephants and only admits 15 visitors per group per day. 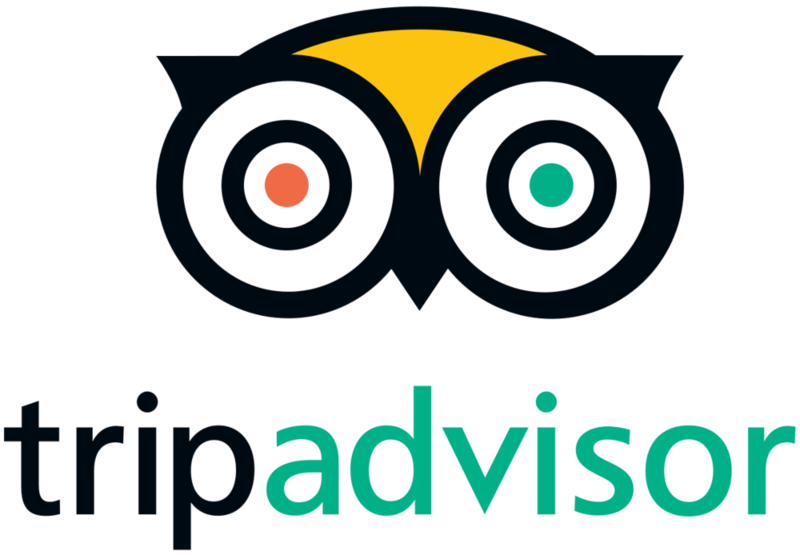 We consider their fantastic guides Omo and Sandy our friends and can testify that for many of our visitors, they manage every time to turn a good experience into a great one. Offering half day and full day programs, tours at this sanctuary offer a mud-bath with the elephants, which protects their skin against the sun. In the afternoon, you accompany them on a trek to the river through a beautiful valley. At the river, the animals love to take a swim and play in the water. You can join them of course! Other activities include lessons on elephant behavior and health and making elephant medicine. Medicine such as tamarind balls with herbs in them help their digestion. You also go collect sugar-cane and corn, otherwise known as elephant candy (they love it!). One of the perks of Happy Elephant Home is it’s a lovely farmhouse that has a swimming pool, so that you can take a refreshing dive during your visit. Happy Elephant Home also stands out because it has a real volunteer program. The minimum stay to really work at the sanctuary is five days. Other than most, this elephant sanctuary has two locations: the main location and their 'Sky Camp'. Their main camp supports five elephants and is located in the lovely foothills north of Doi Inthanon National Park. The 'off the grid' Sky Camp is really on the mountain (at 1000m elevation) where three other elephants live. These are all rescued animals, now enjoying the care and access to nature they were deprived of in the past. Half-day visitors will only see the main camp, but every day- and two-day trip features both camps. However, we also offer a combination tour that includes a morning visit to Sky Camp and trekking at Doi Inthanon in the afternoon. All programs include feeding the elephants, socializing and taking a mud-bath with them. Maeklang also offers a two-day program that allows you to spend the night with the elephants at the Sky Camp. You stay in a cozy bamboo hut, able to experience the jungle at night, as it comes alive with the sounds of its hidden nature. Waking up in the morning with the elephants right next to your hut. Quite the experience. The sanctuary of Maeklang sets itself apart because their program really tries to 'immerse' visitors in the elephant care-taking. Besides collecting food to feed the animals, you also replant the food. Moreover, to give you the real volunteer experience, you can also help cleaning the elephant stables! You will come away with a real sense of what it means to give these majestic animals the treatment they deserve. The family that runs Maeklang Elephant Sanctuary understands the need to educate the (local) public. For example, their outreach promotes understanding and ethical treatment of elephants among the surrounding hill-tribe communities. For more information on our one-day combination tour to Maeklang Elephant Conservation Community and a hike on the Kew Mae Pan Trail in Doi Inthanon National Park, click HERE. When we first sent our guests to Into the Wild, it was still a newcomer, but early on they proved they have a great formula, both for the elephants and their visitors. Last year, we therefore rated them our second-best elephant sanctuary. Now, working with them for another year and without exception seeing our guests love their sanctuary, they are our new Nr. 1! Into the Wild Elephant Camp currently has four elephants. Two of those are rescued from less ethical elephant tours in both Thailand and Myanmar, where they had to give rides and provide entertainment. 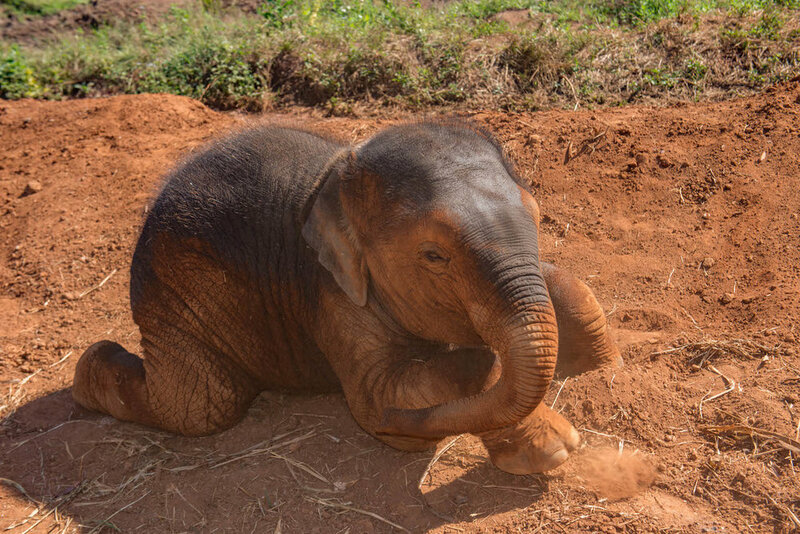 A baby elephant was also taken from there, saving him from such a life.. Now, Piang Dao (or: Little Moon) is a happy youngster with a naughty streak, living at the camp. The youngest of the bunch is Age Gei, who was born at Into the Wild and is now 3,5 years old. Age Gei means Give Me Love in the Karen Hill-tribe dialect (and yes, you won't be able to resist!). The guides at Into the Wild speak English well and are friendly and engaging. Good friends Pai and Siwa started the camp with a wealth of wildlife experience; Pai worked for the Thai Government for over 15 years in their tiger preservation projects and Siwa is a medical wildlife professional. They started the camp to give something back to the local hill-tribe community and their country. The personal engagement of the people at Into the Wild shows in how they approach the visitor experience. It's important to them that people from outside Thailand understand the history and culture of elephants in their country, and how over time this has evolved and now underpins their philosophy of what makes an ethical elephant sanctuary. They are honest about the practical limits of tackling such a challenge and are open to engaging visitors in discussions on how and why they do things. That they take their ethical responsibility to educate the public seriously is part of what makes them a great sanctuary. This shows in how visitors take part in a day at the camp: after the drive from Chiang Mai (about 1,5 hours, with a short break) and following a talk by and with Pai, the visitors get a chance to let the elephants get to know them by feeding them bananas. What follows is a trek into the forest, with the elephants following the calls of the guides. The elephants then are left to do what they want, such as eating jungle food (skills taught to them by the guides, as they never lived in the wild before) and digging up mud in the local stream to throw unto themselves. The animals return to the camp when they want to, and the visitors follow. Following a delicious lunch prepared by the camp staff, sometimes followed by a mud bath, the visitors can take a swim with the elephants in the refreshing mountain stream next to the camp. The ethical engagement of Into the Wild Elephant Camp does not stop at the treatment of the animals, but extends to how they engage with the local hill tribes, which are some of the poorest communities in Thailand. Into the Wild has developed a model in which they not only help the community by buying their crops to feed the elephants, but also actively employ them at the camp. They use the camp as a community-building tool, exposing the tribal communities to each other, to foreign visitors and to new experiences. For example, they organize a summer camp where tribal kids can come meet each other while they learn about the elephants and other things outside their local isolated experience, such as foreign foods. Would you like to visit and experience the ethical elephant sanctuaries yourself? Then join one of our tours to the sanctuaries!